The calendar may have flipped over to 2017, but we have just more nod back to 2016! 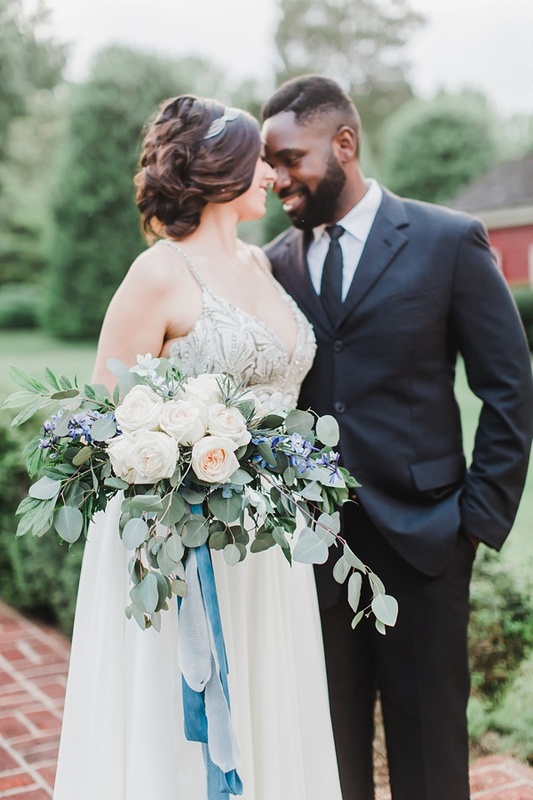 If there isn't one wedding detail that is the most well-loved on social media, it's the flower power behind wedding bouquets, boutonnieres, and ceremony and reception details. From lush earthy arrangements to fresh and modern exotic structures, these beautiful blooms are everyone's favorites across Pinterest, Instagram, and other inspiring weddings. Artfully arranged, we now present diverse floral designs from our past Tidewater and Tulle features that are the best of 2016! 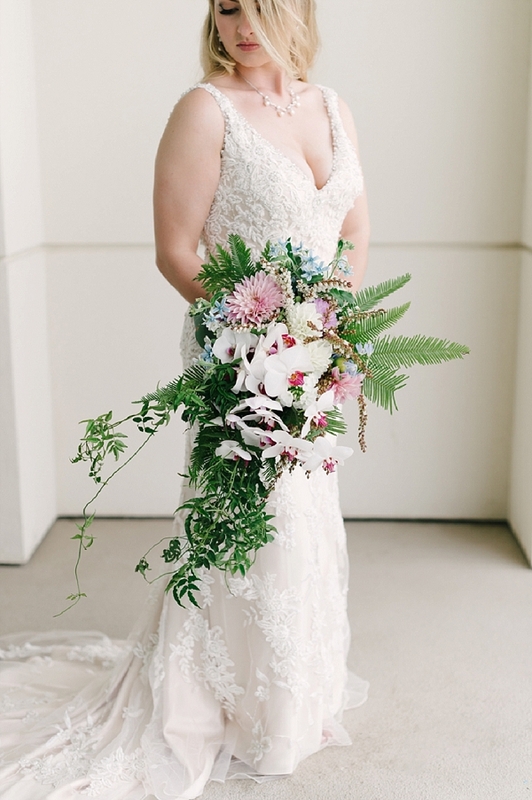 This cascading modern beauty had us swooning over ferns and orchids! A trendsetting green in 2016, ferns add height, width, and texture beyond what the popular eucalyptus can incorporate into a bouquet. And this watercolor-channeled bouquet does it perfectly! Fruits and vegetables like kale and pomegranates equal puffy hearts! 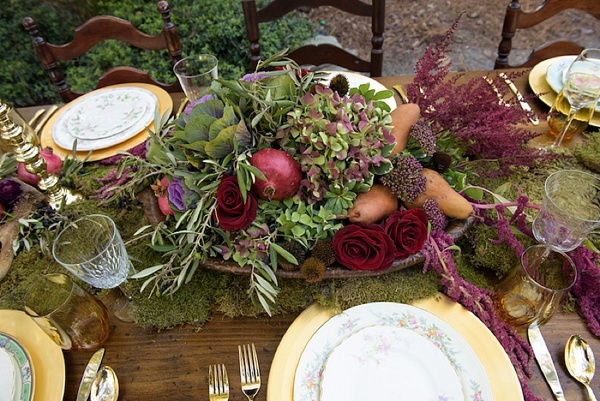 These unexpected pops of color are seasonal and oh so eco-chic when paired with muted hydrangeas on a mossy table runner. 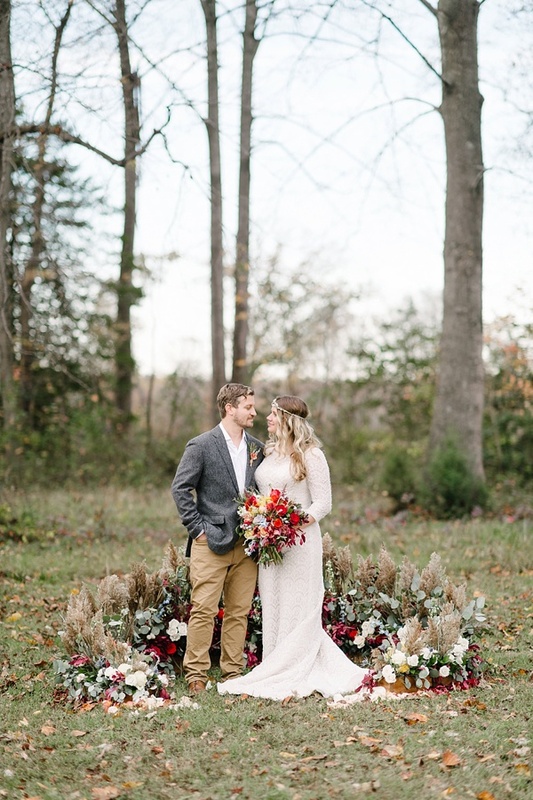 It's a fall wedding dream! We typically think of bouquets being vertically arranged, but in classic paintings, horizontal arrangements were all the jam... so it's no wonder that social media loves timeless bouquets that are wide versus tall and could double as a centerpiece. And of course, hello, pretty blue bouquet ribbons! 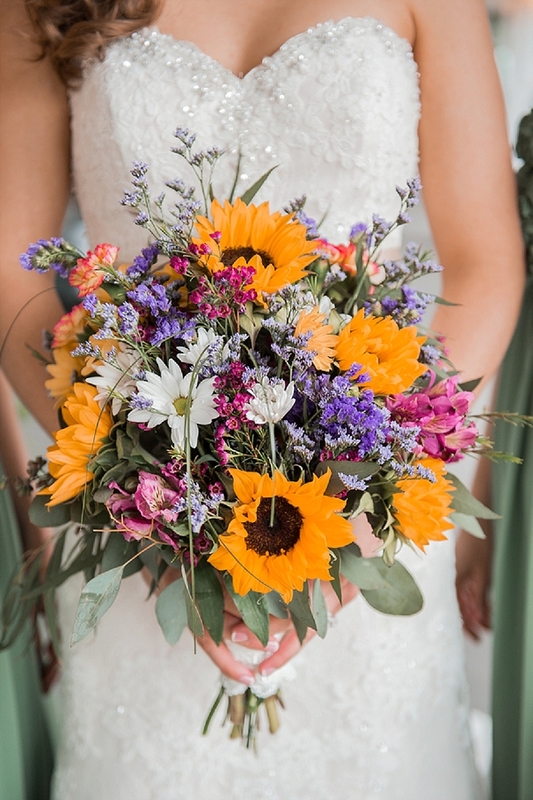 Full of garden color and happy sunflowers, this bouquet gives us and the internet cheerful vibes the whole wedding through! Hand-tied arrangements are always going to be a crowd favorite for any romantic celebration. Let's be real. Who wouldn't want a whimsical sweetheart arch while you celebrate with your loved ones!? This beautiful garden wedding was everything and more when it came to romance under the stars (and arch!). With roses and Queen Anne's lace nestled amongst eucalyptus, it's like being in The Secret Garden! 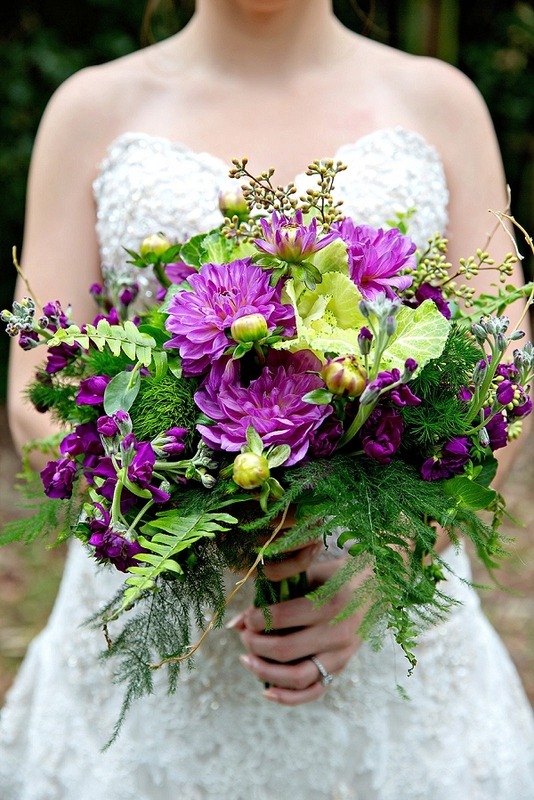 Pops of purple surrounded by lush green is what woodland wedding dreams are made of! We love the ferns, green trick dianthus (a surprising cousin to the carnation! ), and even a little peek of kale... it's straight out of a storybook! 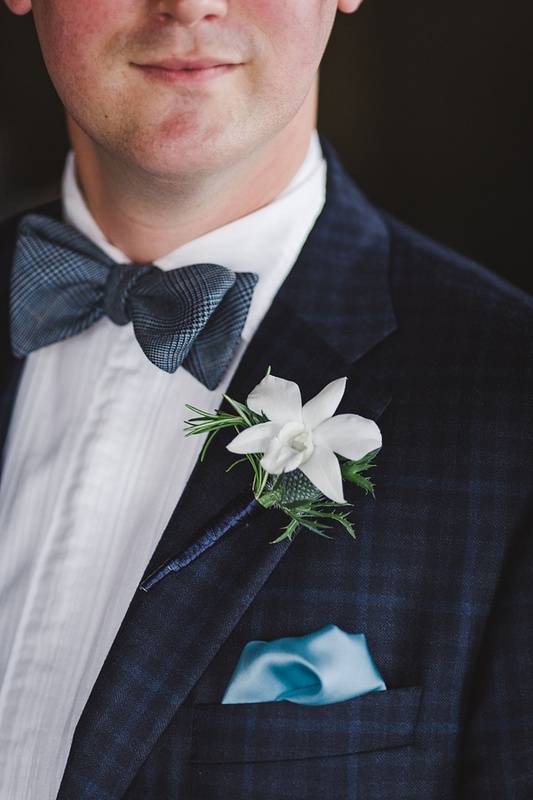 Monochromatic and modern, this orchid-lovin' boutonniere is simply perfected with thistle and rosemary. For any groom looking for coastal style with dark blue attire, we absolutely love this one! Presentation style bouquets just don't get as much love as we would like to see in the wedding world! Elegant and timeless with a foraged appeal, these citrusy blooms just pop on the screen and on Instagram! Put a flower on it! We think everything looks more fabulous when blooms are added! 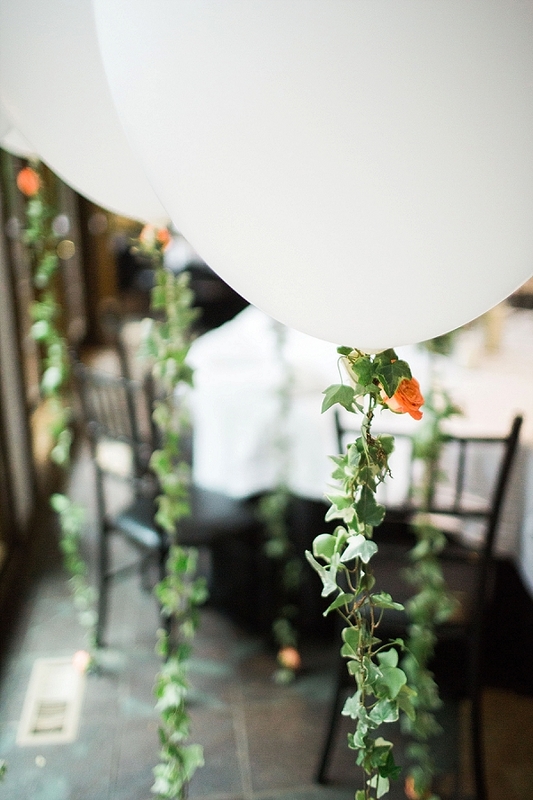 This adorable and playful floral balloon strings add the perfect whimsy to this couple's wedding and gets our creative wheels turning on what else can we put flowers on on a wedding day! When an altar table or ceremony arch isn't your thing, then bring on the ground as your canvas! Romantic and intimate, a ceremony ring encircles a couple in floral beauty and togetherness. If you're having an outdoor wedding, don't be afraid to use the low levels to build up loveliness to show off your location. Silk ribbons for days! 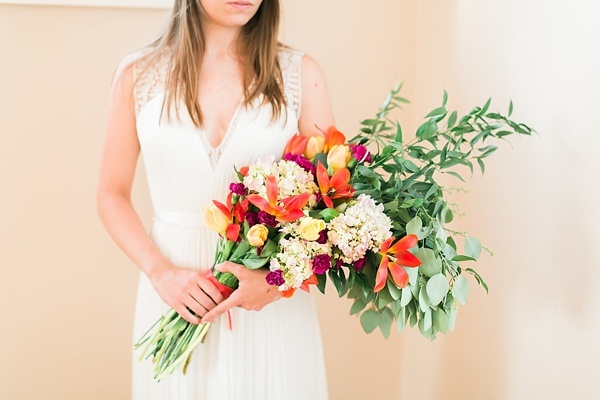 And they lead up to the botanical beauty that is this very Instagram-popular bouquet! 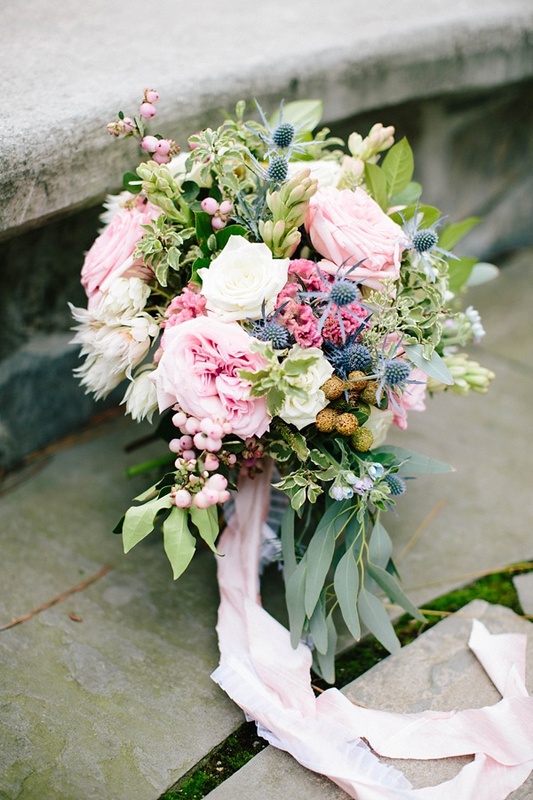 Between the blushing bride protea, garden roses, and cockscomb, it's a texture dream. Pardon us while we just go live in it.